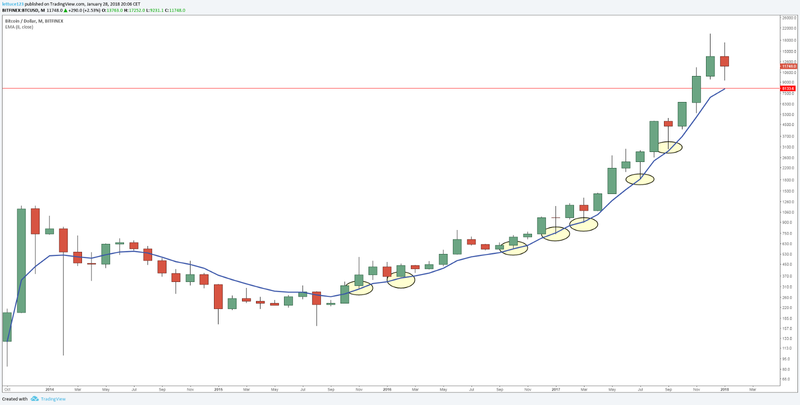 Looking back at :Bitcoin and why I think the bears are still in control right now. My first medium article was based around how I thought the bears were in control over the Bitcoin markets. I just noticed that I never got around to writing a comprehensive update. I think now is as good of a time as any to do so. 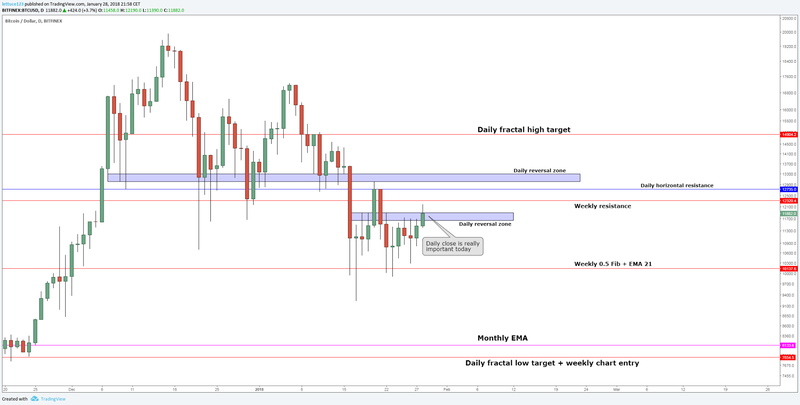 Back then I was expecting a long consolidation ultimately targeting the 8.1k area on the monthly chart. Needless to say we got both. We’ve been moving around in that area for more than 4 months now. I use the EMAs as sentiment and trend gauge. 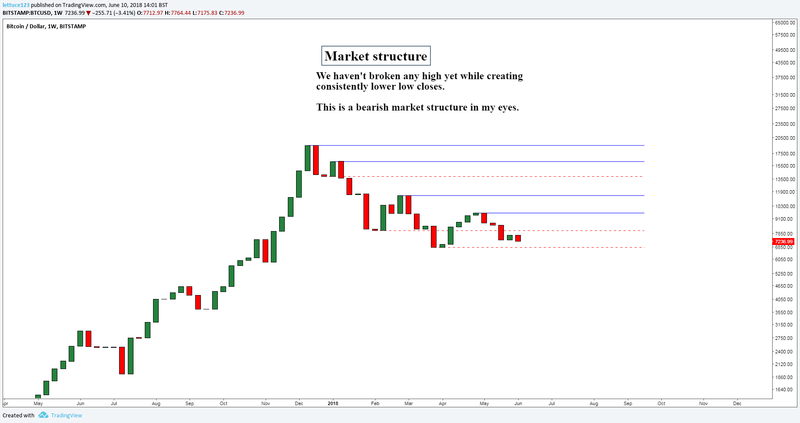 It not holding signifies to me that the market structure has changed and we might be moving towards a differently trending market. The monthly still isn’t bearish but according to it there is quite some room left to move downwards, due to the parabolic rise in 2016 and 2017 not providing much support. Back then I talked about the parabolic break and was warning about it making a significant move down likely. “Short after daily close below 10k” turned out to be pretty good advice and so was warning about having tight risk management. 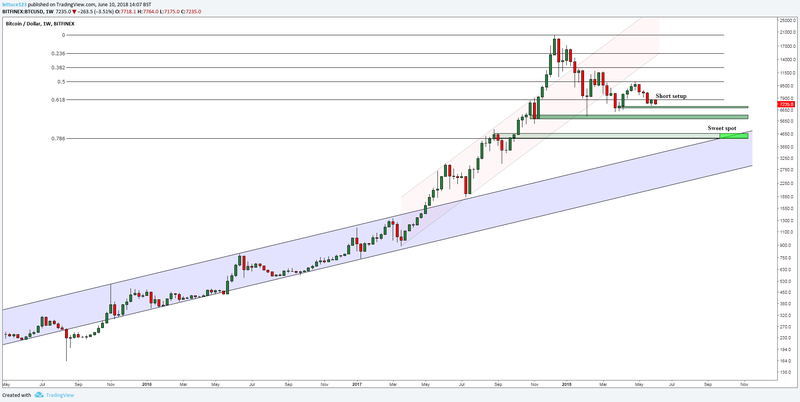 The current weekly chart shows three support areas, the first being the are between 6800 and 7000 the 2nd one being the previous dip to 6k and the last one being the confluence of the old bull channel and the previous top around 4600. I honestly think that if we break the first support around 7000, 6000 will not stand a chance. 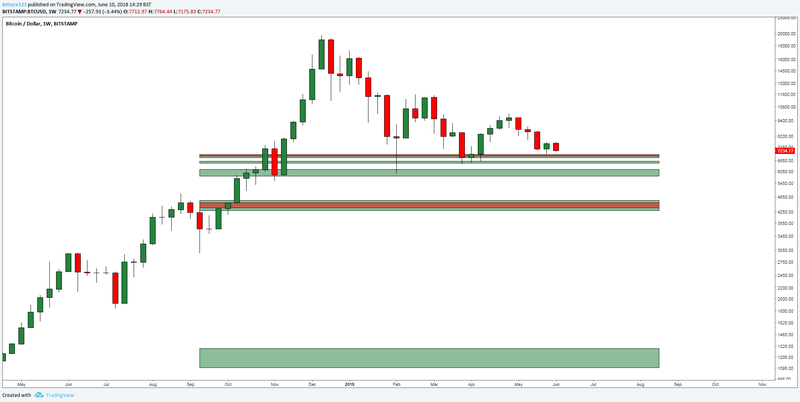 I’ll try to knife catch 7000 once, if that fails I’ll prepare for 4300-4600 based on the monthly and weekly support zones. Blue lines show highs, red lines lows. As you can see we haven’t been able to make any new highs while having made a new low a few weeks ago. The candle I outlined back then ended up closing exactly like I expected it to creating the perfect short setup the day after, making this candle the last high before the move to 6k. Too many charts to keep up with, I know. That’s why I’ll sum it up. Anything below those daily levels and I need at least a monthly or weekly support level to trust any reversal. That means once we fall below $6500 I’ll not buy based on the daily chart. I might buy capitulation but I’ll wait for the big levels to trust any trend reversal. Now those are quite a lot of levels, trading them all would be madness. So which one would I trust, which will I be buying? I’ll wait for price to hit those zones and I’m waiting for it to respond to them. If they do so in the way I want them to I’ll take a stab at longing them. I’m fully prepared to get stopped out on some or even most of these trades, I consider those lost trades opportunity cost. I’ve had my times with shorts ever since my “Bears are in control” article, they’ve been good to me. Being bearish when the chart turned bearish now allows me to knife catch a few times. I’ll leave the big short running that I’ve still got until I get a really good monthly or weekly bull setup but I won’t be adding more Bitcoin shorts (Altcoins are still fair game) unless I get a really really good setup. I’m not going to short BTC far below my perceived value of it, I’d rather just stay flat and try to get a good position for the next run. I feel like the bottom will be in this year even though I doubt we’ll go back up quite as quickly as most think we will. It’ll take time to go parabolic again, in fact, I think after the next capitulation event the market will turn quite boring for a while but I’m pretty sure the parabolic times will come back. And just like last time most people will miss the entry and then beat themselves up over having missed it.